White-tip reef sharks are common inhabitants of the shallow waters surrounding the Galapagos Islands, where several known aggregation sites have become touristic attractions. With the aim to describe site fidelity and residency patterns of the white-tip reef sharks in a saltwater creek, we used the ultrasonic telemetry method. The study was undertaken in a saltwater channel South of Academy Bay, Santa Cruz Island, from May 2008-September 2009. A total of nine transmitters were attached to sharks and ultrasonic receivers were deployed at the inner and outside areas of the creek. From the total of fitted sharks, four lost their transmitters. The results obtained with the remaining sharks showed an elevated use of the inner area of the channel during the day, with more use of the external area during the night. However, none of the sharks were detected at the site every day, suggesting that they may have a number of preferred sites within their home range. More studies are needed to detail the home range and habitat use of this species, and to guide its protection level in the AcademyBay area. Rev. Biol. Trop. 60 (2): 735-743. Epub 2012 June 01. Key words: Galapagos, residency, sharks, site fidelity, ultrasonic telemetry, Triaenodon obesus. Los tiburones punta blanca de arrecife son habitantes comunes de las aguas que rodean las Islas Galápagos, por lo que muchos de sus sitios de agregación se han convertido en atractivos turísticos. Con el objetivo de describir la fidelidad del sitio y los patrones de residencia de nueve tiburones desde mayo 2008-septiembre 2009, se utilizó telemetría ultrasónica en un canal de agua salada en el sur de Bahía Academia, Isla Santa Cruz. A pesar de que cuatro tiburones perdieron sus transmisores, los restantes tiburones monitoreados mostraron un uso elevado del interior del canal durante el día y del exterior durante la noche. Sin embargo, ninguno de los tiburones fue detectado en el sitio diariamente, lo cual sugiere que deben tener un número mayor de sitios preferidos dentro de su área de vida. Palabras claves: fidelidad de sitio, Galápagos, telemetría ultrasónica, tiburones, Triaenodon obesus. Understanding animal movements is a key factor for the development of spatial management tools in multi-use marine reserves. Zonation schemes within these reserves should take into account not only human interests (fishing, tourism, shipping), but should also incorporate key habitats or areas heavily utilized by species of interest. The Galapagos Marine Reserve (GMR), created in 1998, covers an area of approximately 138 000km2 (Heylings et al. 2002), and includes a wide range of habitats, from the open ocean to shallow coastal reefs around each of its 13 major islands and over 100 islets (Snell et al. 1996). Industrial fishing is banned within the GMR, while small scale commercial fishing is limited to a local fishing sector of approximately 1 000 fishers who mainly operate in the shallow coastal waters (Hearn 2008). However, the main users of the GMR are tourists, of which over 140 000 visit the islands each year (Epler 2007). A provisional coastal zonation scheme set up in 2002 was based mostly on a negotiation between fishers, who were interested in utilizing as much of the available fishing habitat as possible, the tourism industry, who wanted sites of interest to be designated No-Take Zones, and science and conservation groups which, due to a lack of information on marine organisms, recommended certain sites to be restricted to research and conservation activities, often based on the presence of turtle nests or sea lion colonies (Heylings et al. 2002). However, little was known at the time about the spatial dynamics of fully marine organisms, and these were largely overlooked during the design of the zonation scheme. Among the key species of concern in the GMR are sharks, although fully protected within GMR waters, many of the species present around the islands are migratory and thus vulnerable to fishing gear in unprotected waters. Additionally, sharks within the marine reserve are targeted illegally for their fins by local and external fishers (Reyes & Murillo 2007). Studies are currently underway to define site fidelity, home ranges and migratory patterns of several shark species in the GMR (Hearn et al. 2010, Ketchum et al. 2009), with a view to providing a technical basis for proposed changes to the zonation scheme, among other objectives. One of the most common sharks in the GMR is the whitetip reef shark, Triaenodon obesus, which is found in shallow coastal waters (Grove & Lavenberg 1997). Whitetips are mostly nocturnal feeders, spending daylight hours resting in caves or on rocky and coral reefs (Randall 1977, Whitney et al. 2007), several of which have become heavily used tourist attractions due to their presence. This study focuses on one of these sites, Punta Estrada Channel, which is located at the mouth of Academy Bay, Santa Cruz Island. The goal of the study was to determine whether individual sharks utilized this site over periods of several months, and whether their presence at the site could be attributed to predictable cycles such as the time of day or the tides. Study site: Punta Estrada channel is a 140m long salt water creek with a width of 20m at its mouth, tapering to 10m at its inner end. It is located in the South of Academy Bay, Santa Cruz Island, Galapagos (Fig. 1). The average depth is around 2.5m from the mid-channel to the inside. Its bottom is mainly volcanic rock at the entrance, but sandy and pebbly on the inside surrounded by mangrove roots. Ultrasonic tagging and detection range: Nine white-tip reef sharks were fitted with ultrasonic transmitters (Vemco Ltd, V16-5H-A69-1303 delay range 60-180 sec) between May and October 2008 (Table 1). These were attached by free divers using pole spears to drive the tags into the muscle behind the dorsal fin. Tagging protocols were approved by the Animal Ethics Committee from the University of California Davis (IACUC Protocol #16022). Ultrasonic receivers (Vemco Ltd., VR-02 and VR-02W) were deployed at two sites in Punta Estrada channel, one at the inner end of the channel (S1) and the other 60m outside its mouth (S2) (Fig. 1). The receiver at S1 was attached directly to a concrete base of 10kg, with the hydrophone facing upwards; while for S2, the receiver was fixed with the hydrophone facing upwards 1.5m from the seabed on a 3m rope mooring with a square concrete base (25kg) and a subsurface buoy. The maximum range of signal detection of both ultrasonic receivers was determined using a range test transmitter provided by Vemco Ltd. (V16-5H-A69-1303, ten seconds signal delay). Inside the channel, the transmitter was lowered from a kayak to a depth of 1.5m at 20m intervals from S1-S2, 200m away. 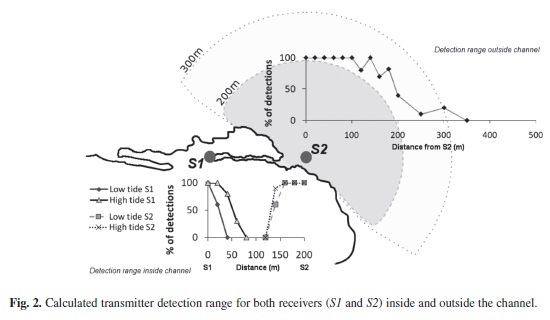 This process was repeated during high tide and low tide, and the detections from both receivers were compared for signal overlap. To test the detection range outside the channel, the range test transmitter was lowered from a dinghy to a depth of 3m at intervals of 20m from receiver S2. In both tests, an omni-directional hydrophone was used to record ten positive signal emissions from the transmitter at every interval. By comparing the data from each receiver with the known pulse emissions at each distance, an average range of 30m was obtained with a minimum of 50% of pulse detections at site S1. No pulses were detected at distances greater than 80m (Fig. 2). We found that the tidal state affected signal transmission by +/- 40m by reducing the detection range from 80m at high tide to 40m at low tide (Fig. 2). There was no overlap in signal detection between S1 and S2. Swell and breaking waves in the channel entrance acted as a signal blocker between both receivers. The maximum detection range for S2 outside the channel was 300m, with 50% of the signals detected at 190m. Data downloaded from the receivers were used to assess the residency and diel pattern of white-tip reef sharks, within the study area. The presence of all individuals was analyzed on a daily basis, taking any detection during one and plotting all data for comparative use over time of the study site by sharks. Data from lost tags was filtered when detections by a receiver remained constant until the end of the study. From these tags, we found that the longest interval between detections was 10 minutes. Any shark with a detection interval longer than that was cataloged as absent from the study site. 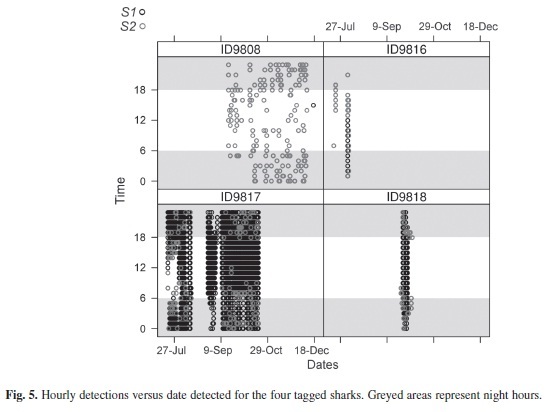 Shark presence during day and night was examined by grouping the frequency of detections by hour and by plotting the time of detection against the dates detected. Hourly detections were transformed to percentages to allow comparisons. A X² goodness-of-fit test was then used to compared the observed data against an even distribution (i.e. assuming an equal number of detections in each hour), following Heupel et al. (2006). Significant differences indicated that individuals were more frequently detected at particular times of the day. Fourier analyses were performed to identify temporal patterns in the use of the study area. The routine used was the Fast Fourier Transformation (FFT), which decomposes time series data into component frequencies, and searches for cyclical patterns of the data (Meyer et al. 2007, Papastamatiou et al. 2009). Patterns can be distinguished as peaks in the power spectrum graphs. We ran the algorithm to identify peaks for: a) total detections of each shark at both receivers; b) total detections of all sharks by receiver; and c) total detections at both receivers. Data were pre-processed by grouping the number of detections every five minutes for each day, which is half the longest interval detection recorded. FFT results are shown as periodograms, presented with the power spectrum standardized by its máximum magnitude and against the period, i.e. days elapsed between similar patterns of detections, in logarithmic scale. Punta Estrada channel is very shallow in its inner area, so tidal variation effect on shark presence was examined during the study period. Tidal heights for Academy Bay were extracted from the published records of the Ecuadorian Navy (INOCAR 2008) and calculated at 8cm intervals (S.D.=±0.02). Acoustic data were matched by dates and hours to the corresponding tidal height and then grouped in 50cm bins. The number of detections in each bin was summed across all days that sharks were monitored and then compared using a X² goodness-of-fit test to the frequency of all tidal heights during the same period every sharks was monitored. Acoustic monitoring of the presence of tagged whitetip reef sharks within Punta Estrada Channel revealed that individuals were present for variable periods between the months of May to December 2008. Although sharks are regularly seen in the area, there was no synchronization in shark movements in and outside the channel. The maximum record of a tagged individual present was four months, while the minimum was two days. Only two sharks continuously used the area for periods of three months, one showing high levels of residence inside the channel, but the other remaining almost exclusively outside the channel. The total length (TL) of the tagged sharks ranged from 130-170cm (Table 1). Six of the nine tagged sharks were detected during the period from June-December 2008. All of these sharks were detected both inside and outside the channel. Their visits to the study area varied from two to seventy five days, with the longest continuous residency of 40 days (of shark 9 817), but no shark was present for the entire period of time that receivers were deployed. Sharks did not show any synchronized pattern in their movements as a group, though at least three sharks were found at the same time in the study area (Fig. 3). Shark 9 808 remained outside the channel almost all the time. Examination of shark detections based on time of day showed significant differences between individual sharks and between sites (Table 2). For S1, sharks 9 817 and 9 818 did not show preference for any particular time of the day, while the presence of sharks 9 808 and 9 816 were skewed towards night and morning times (Fig. 4). In the case of receiver S2, the presence of sharks 9 816, 9 817 and 9 818 was significantly greater during dawn and sunset hours. 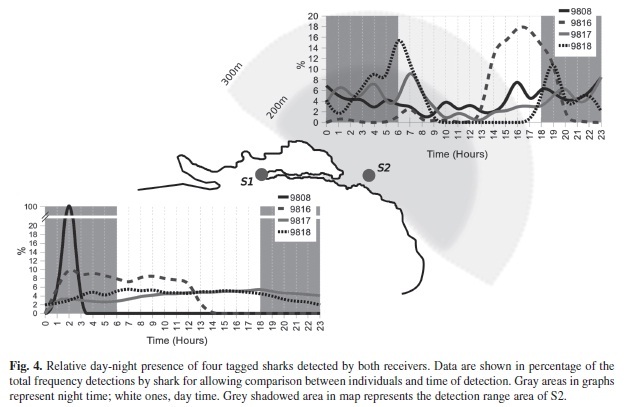 The detections records of Time versus Date confirmed the greater presence of sharks 9 817 and 9 818 at receiver S1, with frequent detections at receiver S2 mainly during night hours (Fig. 5). This situation was not appreciable for shark 9 808, which remained almost exclusively at receiver S2. The significant difference obtained from the X² goodness-of-fit test for shark 9 816 is accounted to be a product of the reduced data available. Results from FFT analysis confirmed diel cyclic visits from sharks to receiver S1, but also a periodicity of 15 days (Fig. 6). Receiver S2 describes an erratic signature with the strongest periodicity marked at 28 days; however, no clear pattern could be inferred from this FFT analysis as the peak might represent data noise. 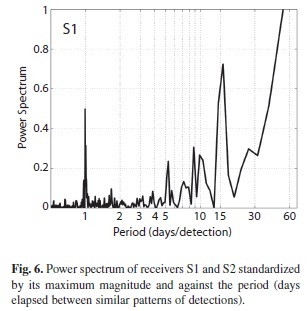 The spectrum for total detections in both receivers (not shown) was mostly dominated by the pattern of S1, given the higher number of detections. Fourier analysis of each individual was affected by the length of the series of detections. Individuals 9 816 and 9 818 exhibited maximum power at four days while 9 808 and 9 817, with longer records, exhibited a well-marked visitation period of 24 hours. Nevertheless, all individuals presented a spectral peak at 23-25 hours of at least 38% of the maximum magnitude. Other periods of interest were marked at 5-8 days and 13-24 days. There was a significant effect of tides on shark detections at S1 (Table 3). In particular, there were increased detections of individuals 9 816 and 9 818 when the tide was higher than 1m, although this difference may be due in part to the greater detection range of the receiver during high tides. No tidal-related pattern to shark presence at S2 was observed. Based on the frequency of hourly detections, no clear pattern was observed in the receiver located inside the channel (S1). However, the observed detections in the outer receiver clearly showed an increase in activity during sunset, night and dawn hours. This is consistent with the activity patterns of captive white-tip reef sharks recorded by Whitney et al. (2007) and other shark species (Nelson & Johnson 1980, McKibben & Nelson 1986, Klimley 1993, Garla et al. 2006). Differences in frequency patterns in both receivers may be produced by the long hours sharks remain continuously present inside the channel, thus departure and arrival times were better captured by the outer receiver. 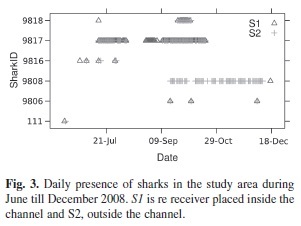 Diel patterns were better described by the FFT analysis of the receiver S1, clearly showing marked diel behavior of sharks using the inner channel of Punta Estrada. Diel pattern of habitat use is very common in a wide variety of sharks (Yeiser et al. 2008, Papasmatioy et al. 2009, Hearn et al. 2010, Clarke et al. 2011) and coral reef fish species (Holland 1996, Meyer & Honebrink 2005, Meyer et al. 2007, Payne et al. 2010) and are more related to nocturnal foraging behavior. The rhythmic 15-day period is thought to be a response of whitetips to the natural variability in the quality of the resting site and food availability, as has been documented for other sharks and rays species by Matern et al. (2000), Heupel & Simpfendorfer (2002) and Lowe (2002). These factors might trigger long absences from the study site; probably in seek of other feeding and/or resting grounds. This behavior has been reported for this species in other areas of the Pacific Ocean by Nelson (1974) and Randall (1977). Rhythmic movement of tagged animals away from a receiver array is known strongly influenced by environmental factors such as wind speed, biological noise and current speeds (Heupel et al. 2006, Simpfendorfer et al. 2008, Payne et al. 2010). Nevertheless, the observed frequency detection of lost tags showed no cyclic patterns in comparison to tagged sharks. As observed during range tests, environmental noise acted as signal blocker at the channel entrance, with no effect on detection frequency of tags by receivers. Low tidal heights were observed to decrease the number of detections in low tide probably due to the reduced wáter column height. Although, this data is not conclusive for showing the tendency of whitetips to possess home area as reported by Nelson (1974) and Randall (1977), it does show that the tagged sharks remained in and around the vicinity of Punta Estrada for extended periods. Whitetips population tend to be genetically isolated (Robbins 2006) due to their restricted home range (Nelson 1974), which convert this species in highly vulnerable to the detriment of its hábitat quality. A expansion of this project should be focused on the home range and habitat use of whitetips and overlay this with the present zoning scheme to detect the level of protection this species has in the area of Academy Bay. The authors are greatly indebted to the Daniel Gaydon Tribute Fund of the Galapagos Conservation Trust. Dan was a keen photographer who was passionate about white-tip reef sharks and the marine life of Galapagos Islands. The present work is part of the Shark Research Project run by the Charles Darwin Foundation, Galapagos National Park and the University of California-Davis. The authors acknowledge the time spent by Julio Delgado, Mariana Vera, Natalia Tirado, Jerson Moreno, David Acuña, Roberto Pépolas, Anna Schuhbauer, Gabriel Vasquez, Eduardo Espinoza, Jorge Baque, Yanella Tutivén, Janai Yépez and Mateo Delgado during field trips. This publication is contribution number 2 044 of the Charles Darwin Foundation for the Galapagos Islands. Whitney, N.M., Y.N. Papastamatiou, K.N. Holland & C.G. Lowe. 2007. Use of an acceleration data logger to measure diel activity patterns in captive white-tip reef shark, Triaenodon obesus. Aquat. Living Resour. DOI: 10.1051/alr:2008006. [ Links ] Yeiser, B.G., M.R. Heupel & C.A. Simpfendorfer. 2008. Received 29-III-2011. Corrected 20-XI-2011. Accepted 16-I-2012.